The story of mike and lynley and the amazing hopewell lodge. Mike and Lynley Clegg have been running Hopewell since 1999. 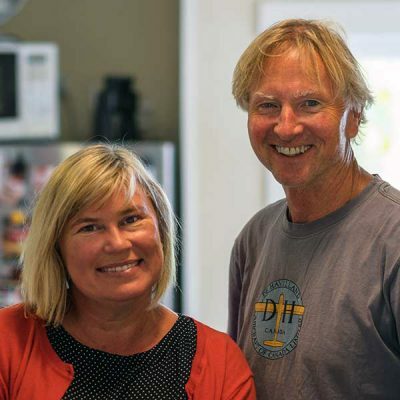 Way back in the 1970’s, Mike went to university with a guy who turned out to be one of the pioneers of the Greenshell Mussel industry here in the Marlborough Sounds of New Zealand’s South Island. So naturally he spent many holidays visiting and staying with him and his family until he and Lynley eventually bought their own holiday house across the bay. After graduating from University of Canterbury with an economic degree, Mike moved to Australia where he worked for an agricultural chemical company selling sheep dipping products to the far flung stations of Western Australia. After 3 years he bought a restaurant/café in the small town of Esperance WA, before moving back to Christchurch, New Zealand and beginning a long career in the Real Estate industry. In the meantime, Lynley was busy finishing her education at a sports college in Finland. After finishing school she remained in Finland for almost 5 years before returning to New Zealand to take up a position as a flight attendant for Air New Zealand, as well as running a small deer farming operation in Canterbury, New Zealand. This was followed by a period managing the office of one of New Zealand’s leading ski and snowboard clothing companies. Lynley and Mike got together in 1993. One of their many holidays to their Marlborough Sounds holiday home, they decided to abandon their lives in Christchurch and move full time to the Sounds. This step they completed in 1998 and they spent the next two years enjoying the community, educating their kids and looking around for the “next step”. And in 1999 one of their neighbors came around to announce that the owners of Hopewell wanted to move back to Nelson and were selling up. The rest is history. Mike and Lynley bought the property, moving there in early 2000. So began a life devoted to renovating and rebuilding Hopewell, a process that continues to this day as they strive to deliver a great holiday experience to everyone who comes to stay at their home. Mike and Lynley have 4 girls between them: Ally, Siela, Libby and Anna who are now all grown up and scattered around the world starting their own lives. As well as running Hopewell, Lynley loves mountain biking, fishing and cooking great food and Mike loves flying planes, eating Lynley’s cooking, making great coffee and playing bad guitar.